Please ensure your Standing Order has been updated to reflect the 2019 Membership Prices - Check on the Link ‘About the Society’ and check the Membership Prices there. If you do not already have a PayPal account, you need to go to www.paypal.co.uk. Click on Sign Up to get a "free" personal account and follow instructions. Follow the remaining instructions displayed on the screen. The funds will be sent directly to us. We will receive an email confirmation that the funds have been sent. You will receive an email confirmation that your funds have been paid. The transaction will then be completed. 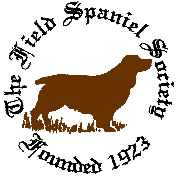 Photographs : - we aim to put up as many photo’s as possible of Field Spaniel Events, if you have any that you would like to submit for inclusion, please send them to charles_holgate@yahoo.co.uk and we will endeavour to put as many up as we can. Also, if any of your dogs are on that you don't like them please let us know and we will remove them. Photographs with Show Results: Photographs of the principle winners are included with the Show Results (where such photographs are available). Please send in your photos to charles_holgate@yahoo.co.uk, please ensure the correct permission is available for the photographs before submitting. Preferred photograph size is a maximum of 800 x 600 pixels. Larger photographs will be scaled down.